During the last few weeks the incidents in the Hambach Forest have come to a head. We had to stand on the side lines as RWE and the police cleared the forest occupation, destroyed tree houses and even cut down trees. We had to handle the shock of the terrible death of a journalist. At the same time, it is obvious that the madness will continue. During the last few weeks the incidents in the Hambach Forest have come to a head. We had to stand on the side lines as RWE and the police cleared the forest occupation, destroyed tree houses and even cut down trees. We had to handle the shock of the terrible death of a journalist. At the same time, it is obvious that the madness will continue. RWE does its utmost to clear the last remnant of the Hambach Forest for brown coal – against all arguments of climate science. The good news is that thousands are pouring into the Rhineland these days because they do not want to accept the clearing of the forest – and the media are full of it. NOW are the crucial days to enforce the preservation of the forest and the coal exit. 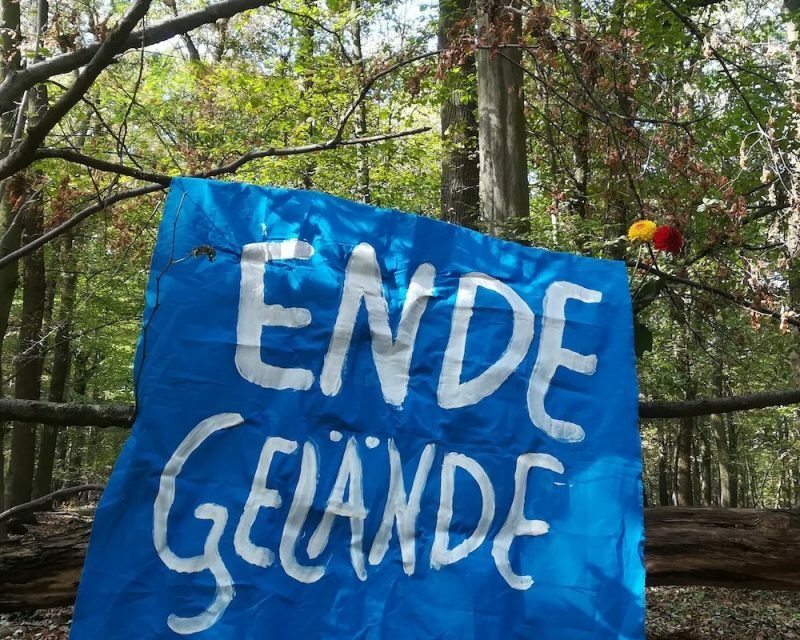 That is why we call on you to come to an Ende Gelände action on 6 October in the surroundings of the Hambach forest, in addition to the long-planned mass action from 25 to 29 October. 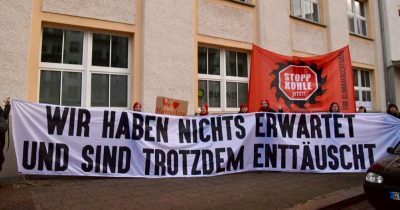 For and with everyone who cannot sit still in the face of the brazen narrow-mindedness of RWE and the NRW government. 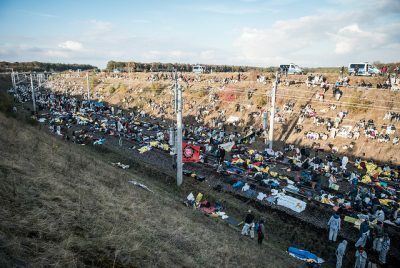 Ende Gelände action on 6 October 2018: Bring (red) hammocks! 1. 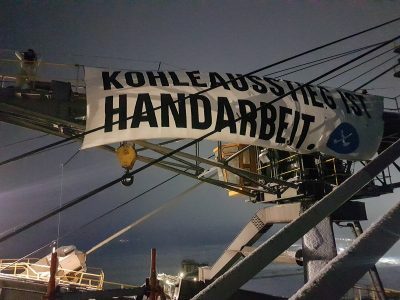 Ende Gelände action on 6 October 2018: Bring (red) hammocks! On 6 October we emphasize with civil disobedience: the Hambach Forest needs to stay! We need an immediate coal exit for climate justice! Hammocks will become our symbol against the destruction. Because forests are among the most popular places for relaxation. And RWE must not continue to disturb the quiet and the residents inside Hambi. Together we settle down and draw a red line. We call on everyone to bring (red) hammocks and red fabric. The forests to those who “hang on” (pun: to those who devote themselves to the forest)! The action is supported by Ende Gelände local groups and friends. It is rather short-term planned. But it runs with the usual action consensus of Ende Gelände, the necessary preparation and has everything else, you like about Ende Gelände actions. If possible, plan to arrive already on Friday, one day prior to the action. We will inform you about overnight stays with the usual short-term nature. If you already want to book tickets, Cologne is a good station. Share this information – and stay in the loop! On the same day, we as Ende Gelände alliance join the demonstration “Save the forest! 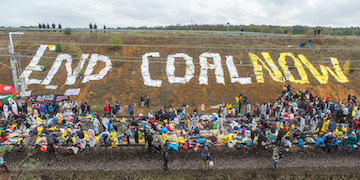 Stop coal!” which is on 6 October at 12 o’clock at the Buir train station. The environmental associations Alliance for Environment and nature preservation (BUND), Campact, Greenpeace and the friends of nature (NaturFreunde) are calling for demonstration to send a clear stop signal to RWE prior to the possible start of the deforestation on 15 October 2018. The demonstration was originally planned to take place a week before that (14 October). One week ago, the camp “Save the forest – protect the climate!” set up its tents on the fruit meadow at Kerpen-Manheim. At our camp there are a diverse education and culture program, meals, sanitary facilities etc. You can spend the night there in your own tent. The camp is only a few kilometres away from the Buir (suburban train) station. Furthermore, the skill share of the Hambach forest will take place at the camp from 21 to 30 September. For Sunday, 30 September, Ende Gelände calls for a big, decentralized action day, under the slogan “Hambi stays! Coal exit now!”. We neither want coal exit by 2038 nor by 2030 – but rather an immediate exit. Because we must get out of this globally devastating, dirty energy, which has no future. 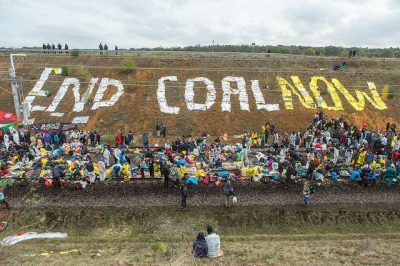 For the decentralized action day on 30 September, we call on people in many cities in Germany and Europe to demonstrate now and take many with them – for the immediate coal exit and Hambi’s preservation! In the field, there is supposed to be another forest walk to the Hambach Forest which will now become huge demonstrations against clearing and deforestation. Whether demonstration, banner action or public action training – draw attention to Hambi at your place, invite your local press and send our social media team a photo to spread. 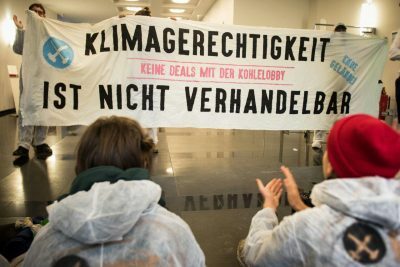 To avoid misunderstandings: the mass action of civil disobedience against the coal infrastructure around the Hambach open-cast mine will take place as planned from 25 to 29 October 2018. Because no matter what the next few weeks will bring, we will continue to fight for an immediate coal exit and for climate justice. The mobilization is really getting started by now! You can organise information events in your villages and towns, plan a bus to action or help with the mobilisation for the special train that will travel from Prague – via Leipzig, Berlin and Hanover – to the Hambach Forest. For questions: busmobi@ende-gelaende.org (PGP-key) bzw. sonderzug@ende-gelaende.org. Also have a look at your local climate group or see if an event or action training will soon take place near you. Hambacher Forst: Latest information from the forest can be found on Twitter, among others @HambiBleibt. For lists of what is needed in the forest, click here. Every Sunday at 11:30 am forest walks take place. Meeting point will be announced at short notice, often the meeting point is at the Collas gravel plant. This is a 20 minute walk from the Kerpen-Buir tram station. The walk through the forest is intended to provide information about the forest and is also suitable for and to do with children. More information can be found here, for questions write to info@zobel-natur.de. Pickets: There is a permanent picket between Buir and the Hambach Forest, which wants to be occupied or visited. You can find it here. There you will also find updates, which actions are currently running and how and where you can take part on site. More on Twitter @MahnwacheHambi. Aktion Unterholz („Action Undergrowth“): A few months ago, Aktion Unterholz joined forces for the clearing season to plan short-term actions of civil disobedience. Their website with contact possibilities and further information can be found here. AZ Köln: The Autonomous Centre in Cologne has set up an information stand for people who want to come into the forest or at least into the vicinity. You can find it on the homepage or in the Luxemburger Str. 93, 50939 Cologne. On the weekend 6 to 7 October the autonomous centre (AZ) in Cologne hosts the RabAZ. The AZ is one of our allied places, which is also threatened by eviction. Therefore we would like to invite you to the action and networking days, in particular the soli-demonstration on 7 October (Sunday). More informations here. PS: We want to share this song with you: Hambi stays! (Lyrics and chords can be found here). It is so encouraging to see how many people are defending Hambi right now!